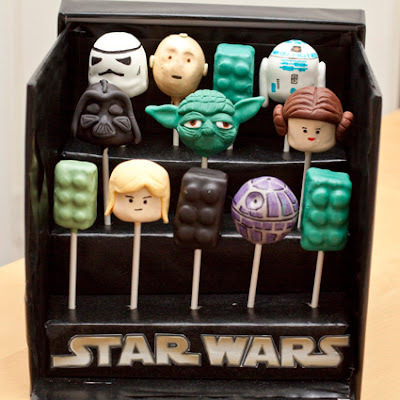 Star Wars Lego cake pops, this is! Gosh.. I really had fun making this!!! Honestly felt like I have won a million dollars after making this hahaha! 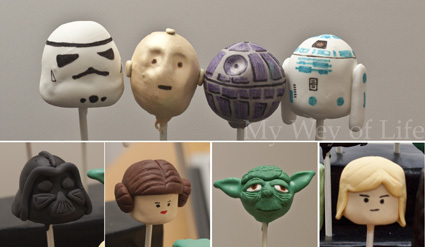 This set of cake pops was for my customer who bought Chinese New Year Cupcakes and Mother's Day Cupcakes! Thanks for supporting me Liz and Ray! 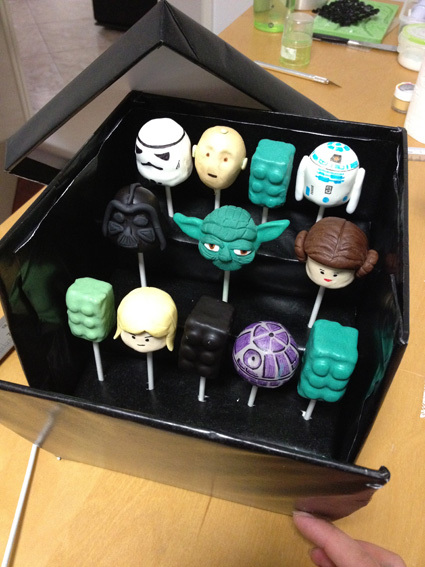 I told Liz to leave it in my awesome hands making the packaging and cake pops so it will looked awesome when Ray receive the special gift! Looking for the perfect box that I wanted is a challenging task. I have shop around everywhere just to find this Square gift box! I wonder why they don't sell square ones anymore.. :( I like square! Lucky to finally found one and the last one from a shop in the city. 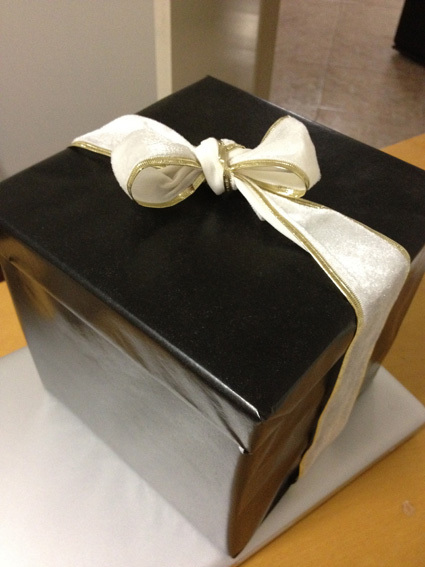 Wrapped with black paper and this is how it looks like. But when you open the lid....The front bit will pop down! This will give a shock effect to the receiver hahahaha. Adrenaline! 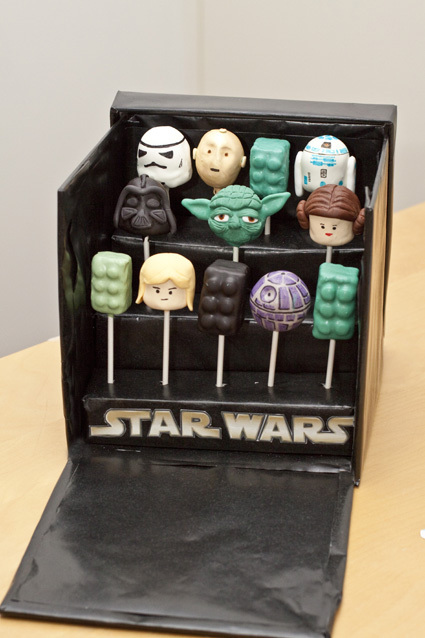 nah kidding..
Then you will see all the cute cake pops inside! Haha.. those are the positive part of it.. the negative (funny) part was making the perfect yoda..
Wanna see my first attempt of Yoda??? Remember to check out my Giveaway page! I'm giving away a yummy cake or Poppin Cookin Hamburger set! Click here to find out how! 2 more days to go! Since you used Google images of ideas and therefore other people's ideas shouldn't you be crediting them? if you say so ANONYMOUS! I SHALL and there you go. What a lovely post Wey! 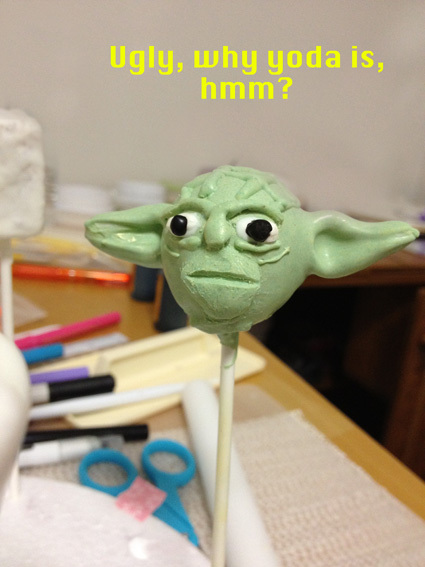 Version 1 of Yoda does sorta look like Homer now that you've mentioned it! Just in case you're wondering.... tho they sure felt too cute to eat, we've finished the cake pops within a week. The cake was really awesome and tasted like freshly squeezed OJ! PS: Yoda was first to be nommed by the super happy birthday boy!